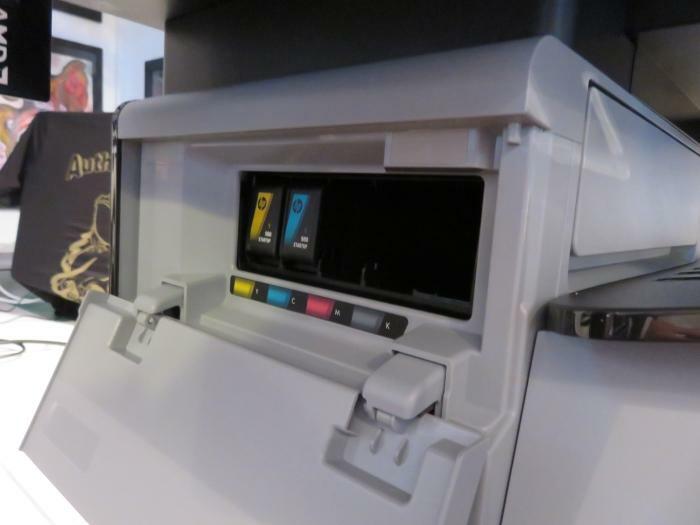 Inkjet technology isn’t often the go-to choice for big businesses looking to get things done quickly and efficiently, but HP wants to change that with its new Officejet Enterprise Colour MFP X585. It’s said to be able to print twice as fast as a comparable laser (up to 75 colour pages per minute in fast mode), while offering a low total cost per ownership and minimal maintenance requirements. The key feature of the Officejet Enterprise Colour MFP X585 is a fixed print head, rather than a head that travels back and forth. It’s what HP calls PageWide printing technology, named as such because the print head sits in a fixed position spanning the width of an A4 page, and can print the entire length of an A4 page as the paper rolls underneath it. It’s a technology that’s meant to cut down on moving parts, consumables, power consumption, all while increasing the speed with which pages can exit the machine. Since the print head is fixed along the entire width of the page, there are forty thousand nozzles in place to fire ink at every inch of the page as it travels underneath it. The engine that feeds and rolls the paper under the print head is the only moving part, and without a moving head, the X585 can offer reduced noise and vibration characteristics. The print head is fed by side-loading CMYK pigment ink cartridges that are longer than what you might be accustomed to seeing in a consumer inkjet device, and they offer yields of 10,000 pages for the black cartridge, 6600 for cyan, and 6000 each for magenta and yellow. The printer is rated for a recommended duty cycle of up to 75000 pages per month (with a recommended monthly page volume of up to 6000 pages). 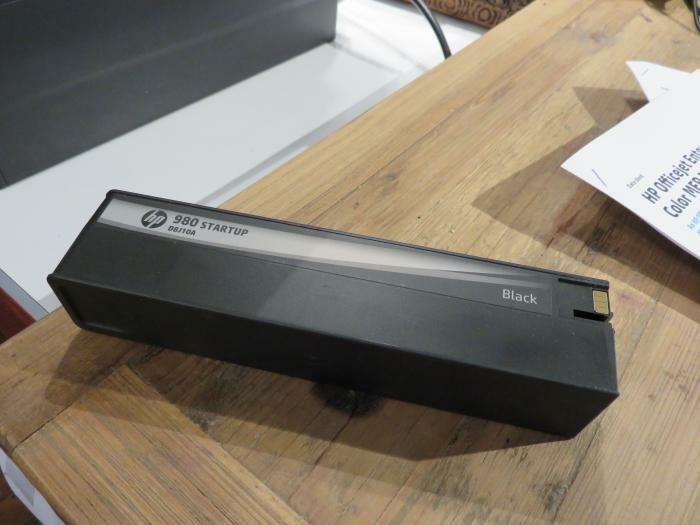 HP said the print head is designed to last for the life of the printer and that the only consumables are the ink tanks. HP claims that the inks are water and highlighter resistant, and designed for permanence. HP has used PageWide printing technology before on models such as the OfficeJet Pro X576 multifunction printer, but that printer was designed with the small and medium business market in mind. The new X585 model has been scaled to work in the higher end of town, and it incorporates more management and security features. There is a built-in 796MHz CPU and 1.75GB of RAM, and it provides support for the Open Extensibility Platform (OXP), which allows the printer to be tailored to enterprise environments with custom programs as needed. It’s the same environment that the company uses for its enterprise laser printer products. 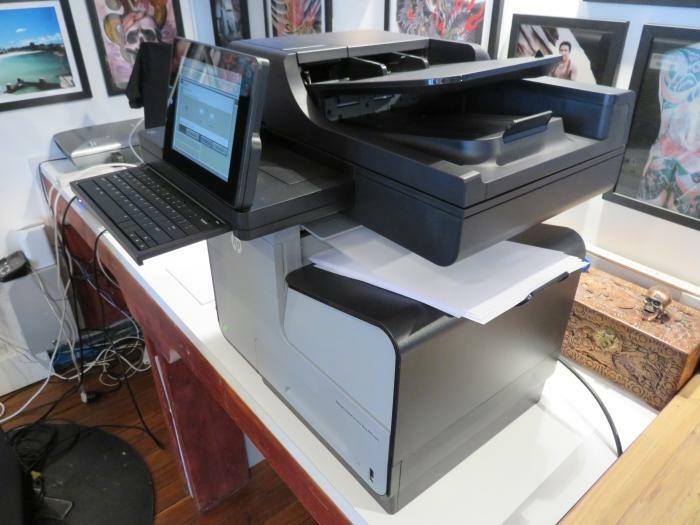 The top half of the new enterprise printer is designed with workflow in mind, offering a 100-sheet tray (on the X585z model) for single-pass, automatic duplex copying and scanning, a built-in 8in screen, and a pull-out keyboard (on the X585z) for things such as document editing. Optional modules can be installed in a dedicated bay (called a hardware integration pocket) for added capabilities such as NFC touch-to-print, and Wi-Fi access. Paper handling is facilitated by a 300-sheet face-down output tray, a 50-sheet multi-purpose tray, and a 500-sheet input tray, which feeds an engine that can perform automatic duplex printing. Only up to A4-sized paper can be used at this point, and stock up to 300 gsm photo paper can be used. Interface connections include USB 2.0 and Gigabit Ethernet. The HP Officejet Enterprise Colour MFP X585 is available now with a starting price of $2890.